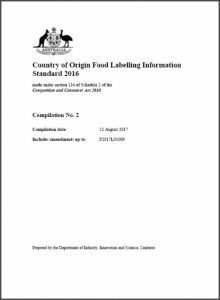 Introduced in 2016, the Country of Origin Information Standard is the Australian legislation for the new labelling requirements. 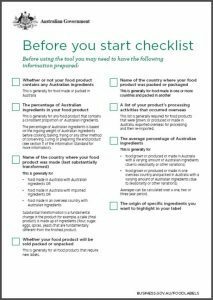 Any Priority Foods labelled from 1 July 2018 must follow the new rules. More details on what is required can be found in this Information Standard. Collate your product data using this Country of Origin checklist. It will assist in gathering the information you may need to generate your new labels with the online tool. The Country of Origin Labelling Online Tool is available at www.originlabeltool.business.gov.au. Is your product a Priority Food or Non-Priority Food? 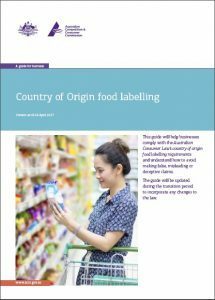 Does it need the new Country of Origin labelling effective 1 July 2018. Learn more in this guide from ACCC. 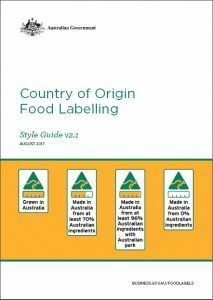 This Style Guide shows how the new country of origin labels should look and be used. The CoOL Online Tool will help you determine and download the appropriate label for your food product. 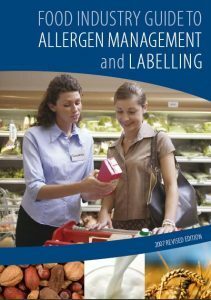 The Food Industry Guide to Allergen Management and Labelling provides guidance for industry in managing allergens and is relevant to those involved in the supply, handling, production and sale of foods. *Please Note: that Lupin has ben added as a new allergen in 2017 and is NOT included in this Guide. 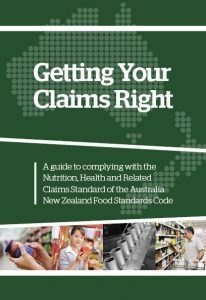 Do you know the difference between nutrient content claims, general level health claims and high level health claims? Follow the flowchart and learn more about FSANZ approved claims. 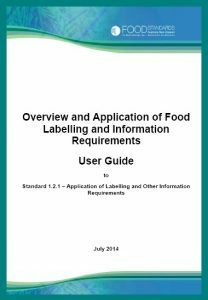 This Guide sets out how the labelling requirements of the Code apply in different situations and outlines certain exemptions from the requirement for food to bear a label. Added sugars – sweet claims? Food Regulation – what does this mean?